Adäka means “coming into the light” in the Southern Tutchone language. 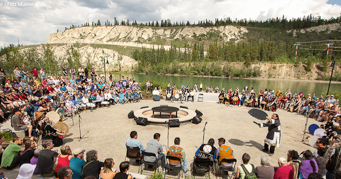 The Festival’s mission is to develop and deliver a world-class, iconic festival that showcases, celebrates, and fosters the development of Yukon’s diverse and distinctive First Nations arts and culture. Dawson City holds a wonderful music festival that is contiguous with the conclusion of the colloquium. The key here is that accommodation normally all booked quickly (often by now!). If you are interested you will need to make your own reservations for this event. Check out the web for available options. The sooner the better.